The pictures must be of different outcomes, and evoke different feelings. Draw the destination, not the journey. Ensure that the collection of outcome pictures is realistic in view of recent history, and in view of what the organisation expects. Even the most unlikely outcome pictures are important as possibilities. They illustrate vividly what won’t happen. Ask smaller work units inside your own to define objectives and draw pictures in the same way. This is a good time to compare the re-generated objectives and pictures with the original business plan. You can compare your objectives and outcome pictures with those of lower- and higher-level work units. The pictures must be of different outcomes, and evoke different feelings. Draw the destination, not the journey. It is important to ensure that each outcome picture shows a distinct year-end outcome for the unit. Each picture must be definitely attractive or repulsive compared with alternative pictures next to it. Ideally, today’s drawing of the year-end outcome has the look and feel of the way you will remember the corresponding real outcome a year or two after that. That memory probably won’t include numbers. It will have a distinct look, and definite feeling. That look and feel is why the outcomes are drawn as pictures, and why you look for an emotional response. During your initial visualisation brainstorm, you are likely to have thought about steps on the way to the outcome, and did not first see the outcome itself. It is easy to first think of prerequisites to success, helpful or horrific incidents during the year. Following the concepts in business planning, you might also think of leading indicators of the year-end outcome, which is another way to lose sight of the outcome itself. Partial Success Carelessness with financial planning and spending BECOMES Partial Success Some surprise year-end variances that the boss or CFO would have wanted to avoid. No matter how you lost sight of the outcome, make sure you find it. The way to find the hidden outcome picture behind a prerequisite, incident, or indicator is simple enough. You just ask, ‘Why does this matter?’ and ‘So what?’ as many times as necessary. Ensure that the collection of outcome pictures is realistic in view of recent history, and in view of what the organisation expects. There is no point in unrealistic planning. If your pictures of planned success don’t match both history and your organisation’s demands, something has to move. It may be the organisation’s expectations that you need to adjust, or your own. Even the most unlikely outcome pictures are important as possibilities. They illustrate vividly what won’t happen. Far-fetched extreme outcomes serve an important purpose. This point was made in the drill-down from sketching of pictures at each level of success and failure. The important message is that you are making sure that bad outcomes stay unlikely. If you are hoping for an unlikely success above planned results, you may be taking steps to maximise that small likelihood. Either way, you deserve credit for making smart decisions. You might even deserve extra funding. Ask smaller work units inside your own to define objectives and draw pictures in the same way. If you are the manager of a big unit containing many smaller units, those smaller units can all set out their objectives using the how-to steps in this guide. You will appreciate the clear lines of sight that follow. You can then verify that you will deliver on your objectives if they deliver on theirs. This is a good time to compare the re-generated objectives and pictures with the original business plan. You have now re-defined your unit’s intended outcomes for the planning period. The approach used here was probably different to the way you approached the business plan, though drawing on the same body of business expertise. If you have the opportunity, you might like to revise the business plan in the light of what you’ve discovered already in the ‘risk’ based review of objectives. Your new collection of ‘success’ pictures could be different to the objectives in your business plan. If so, you need to understand why, and to do something to close the gap. You will also want to be sure that your unit’s strategy and resources work with the objectives. Your new pictures will include new successes based on avoiding unintended disasters. You may or may not have a reason to change the business plan to recognise them. If there are no fundamental disagreements between the two documents, you can relax. Just treat the new version of the objectives and outcomes as something done specifically for risk management purposes. You can compare your objectives and outcome pictures with those of lower- and higher-level work units. 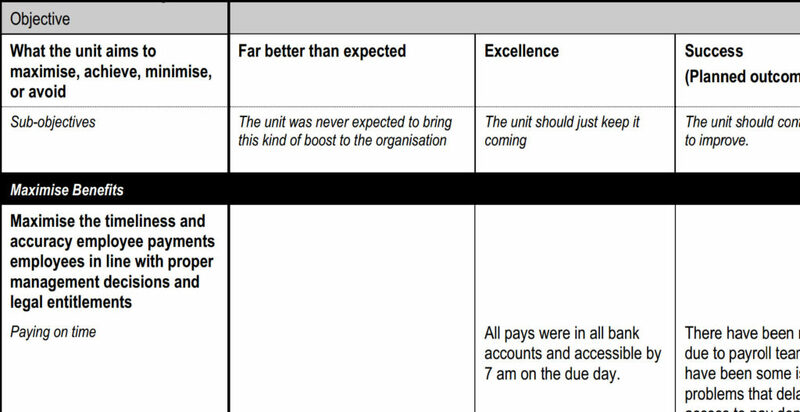 If your unit is large and contains other work units, now is a good time to look at the alignment of the smaller unit’s objectives with your own. You might also learn something interesting by comparing the outcome pictures at different levels. You can also check your alignment with the business planning objectives for the larger organisational grouping of which your own unit is part. A business plan explains what the unit delivers to the organisation in exchange for the resources it uses. The business plan document is usually a formal record of decisions already made. Check similar pictures appearing for multiple objectives. Review each picture on its own. Review the pictures in each cell. Review the line of outcome pictures for each objective.Review the collection of outcome pictures as a whole. Sub-objectives can be useful. Small is beautiful. Appearance counts. The first step is validating the unit’s objectives. ‘Risk’ is meaningless without the objectives.You understand each objective only when you see how success and failure are different. To see that difference, draw pictures. The outcome pictures must show your real world as it might be at the end of the planning period. You will use the outcome pictures to understand the significance of unplanned developments during the year.